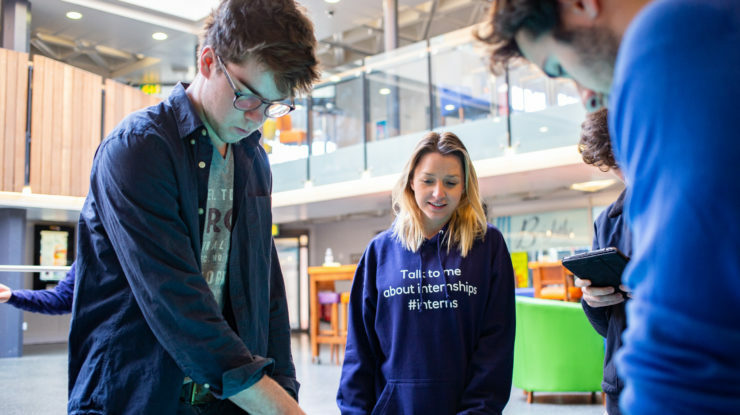 We worked with Tonic Agency to help RBS’ Early Careers Team engage graduates by utilising gamification and technology to attract potential candidates. As a result of the success of a previous experience created for the Early Careers Team, we were able to again collaborate to create an experience that would not only attract graduates to their stand, but also increase dwell time, deliver brand messages, and engage students in a gamified experience that would lead to meaningful conversations. We used a collaborative touchscreen table that invites multiple people to gather around and use physical markers that change digital content. Students were challenged to use the markers as dials to interact with puzzles and brand messages in a race against the clock. By using technology they were able to speak the same language as the graduates and add value to the experience, attracting the right candidates to have the right conversations with the RBS team.